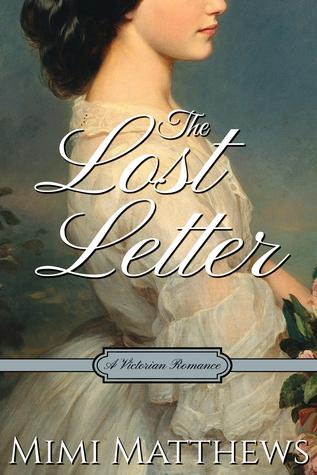 As many of you know, my debut Victorian romance, The Lost Letter, will be released on September 19. It’s currently out on review and—I’m pleased to report—the advance reviews have been truly wonderful. Kirkus Reviews calls it a “beautifully told” historical love story with “consistently refined and elegant” prose. And Chicks, Rogues and Scandals calls it “flawless” and “one of those books that you keep on the bookshelf forever.” Unfortunately, it will be seven more weeks before you can read The Lost Letter and judge for yourselves. In the meanwhile, I’m very excited to unveil the first chapter of my novel here on my website. You can view Chapter One of The Lost Letter HERE. If you’d like more information, including pre-order links, reviews, and the official book blurb, visit The Lost Letter book page HERE. For those of you who would like to read the entire novel before its release date, I’m offering three signed, advance paperback copies of The Lost Letter via a Goodreads giveaway. This giveaway runs from August 2-30 and is open to readers in the United States, United Kingdom, and Canada. 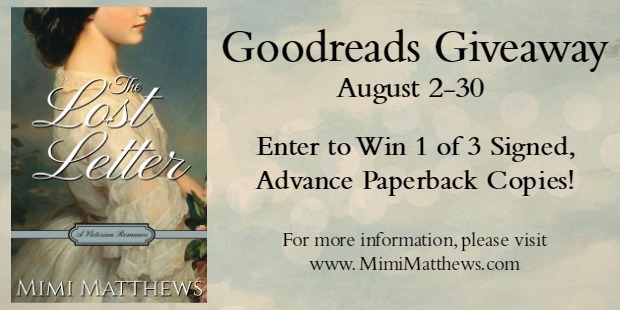 To enter, follow the link below to the Goodreads Book Giveaway page. Next week, I’ll be offering an exclusive, Victorian-themed letter writing giveaway just for my newsletter subscribers. Not a subscriber yet? That’s easily remedied. Simply sign up for my author newsletter via the form at the bottom of the screen! Thanks Wendy :) I’m so glad you enjoyed the first chapter! Delightful first chapter, Mimi. I do love a good governess story! Congratulations on the early reviews and on your sparking debut! Running over to Goodreads now to enter the contest. Thanks so much, Jeanne :) I’m glad you enjoyed it. Best of luck with the giveaway!